Our bold trio travels cross-country by trailer - and sorely lives to regret it, especially when the makeshift vehicle crashes its way down a cliffside. 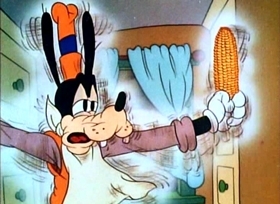 Goofy struggles with corncob, during which he sticks his fork in a light socket; the resulting electric shock pops the corn. Forget The Band Concert, Lonesome Ghosts and Boat Builders. 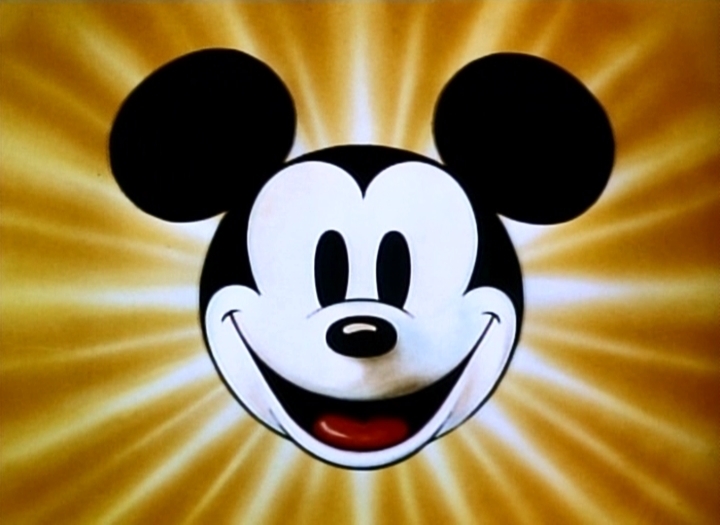 This is the best Mickey short ever. Just look at the closing of the panoramic fan, the milking of the cow and the cutting of the corn - all magical and cut to a pace that the rest of Hollywood took another twenty years to catch up with. I don't understand why the scene with Goofy being electrocuted was cut. I mean they left a similar scene in other Goofy shorts like Hold that Pose and How to Dance. My favorite of the Mickey/Donald/Goofy shorts. Every scene and interaction among the friends is superbly done and the animation is also superb. If I had a favorite Mickey, Donald, and Goofy short, this would probably be it. At the beginning, you think they're in a nice and clean part of town, but as the scenery folds back into the trailer, it turns out to be a heavily polluted city dump. Mickey awakens and the trio begins their trip. Goofy is driving down the road, Mickey is gathering food which are corn ears that he cuts off from the field, milk that he gets from a cow, and water that he collects as they pass a waterfall. Donald, however, is still asleep so Mickey pushes a button to fold his bed in. Later on it got pretty wild when the trailer separated from the car Goofy was driving. Donald and Mickey are terrified. Well, trailer and car soon reunite. Goofy apparently never knew they separated. I liked the scene where they were eating lunch. Goofy picks up a watermelon slice and the drawers hit him, causing the watermelon to splatter on his face like shaving cream, which he shaves off. I also laughed when Mickey said "Hey, who's driving?" Donald then said "Yeah! Who's driving?" Goofy says "Why I am!" One scene that was censored was where Goofy accidentally sticks a fork in an electric socket and gets electrocuted the corn he's eating turns into popcorn. Why was that censored? It's not like it's going to influence children to stick a fork in a socket and Goofy did it by accident anyway. The only children that would do that are babies who'd do it regardless of whether or not they saw this cartoon. I, myself, have never seen the uncensored version of this short. Mickey, Donald, and Goofy hit the road in a gadget-filled trailer in this short, but all the gadgets in the world can't help them when it's Goofy doing the driving. A true comedy classic from beginning to end. Good short. It's a classic! 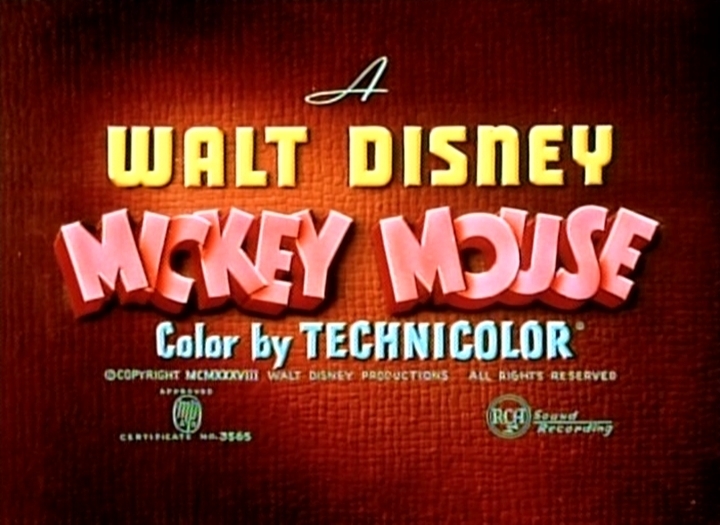 This is one of 8 classic Mickey Mouse cartoons that I love so much. 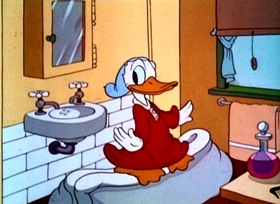 The part where Donald sings in the bath was really boring until he saw the robins. 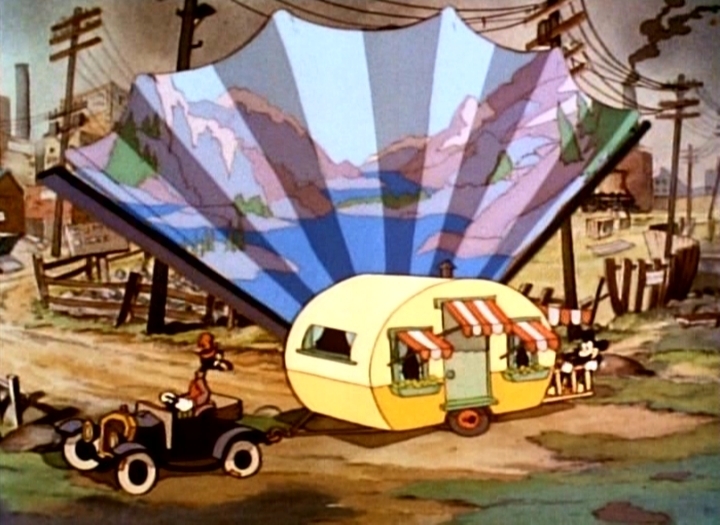 Plus the ride on the cartoon began when the trailer came loose. I think each fan needs this cartoon in their collection. 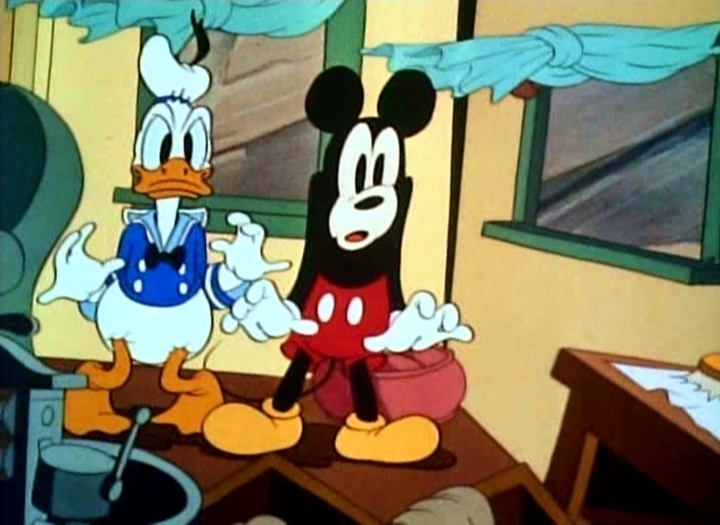 Probably the best Mickey/Donald/Goofy short ever; the breakfast scenes and the bit where Donald is forced to wake up are immaculate. 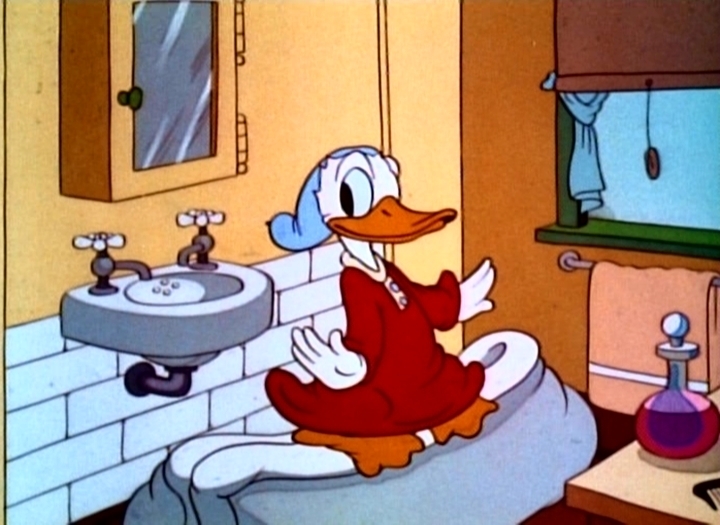 This one's part of the traditional "Disney Cartoon Show" which airs on Swedish TV every Christmas Eve. It seems influenced a bit by Chaplin's "Modern Times", premiered two years before, where the machines were taking over (Donald's compact room that changes its furniture abruptly). But when you watch Chaplin's films it's plain, too, how much his stunts and his long faces have in common with early cartoons like Daffy Duck or this one. The best animated short ever. Not just hilarious but the music and drawings are synchronized perfectly. When the trailer is rolling end over end and the boys are being thrown around inside is great and the trailer going around corners using the fence as a track are genius. Only Thru the Mirror is better as far as animation. I rate this cartoon a 12 out of 10. It is so giddy with invention, detail, and rich character-based animation that it seems the entire crew must have been in love with the possibilities from the start. I can't help wondering if, in the creation of that wonderful opening -- the hallucinatory scene in which one background location winds up being a backdrop for another -- our boys at the drawing board might have been dipping into a special stash of inspirational substances. 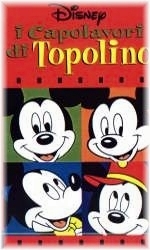 This has got to be my favorite Mickey Mouse cartoon ever! Very imaginative! I want that camper! Don't worry, Ryan. I've seen the scene where Goofy gets electrocuted on the "Spirit of Mickey" video as well as the "Extreme Adventure Fun" DVD. I'm sure you'll find it hilarious like I did. I’m just going to be honest – I cannot be objective about Mickey’s Trailer. It is an absolute favorite for me, and there are so many emotional ties to this short that I can’t sit here and judge it. 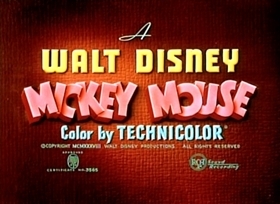 This was one of the very first Mickey cartoons I ever saw, and I have always loved it. It’s not my absolute favorite (either Lonesome Ghosts or Hawaiian Holiday would have that distinction), but it probably is the one that means the most to me. The first Disney book I read to my son and my daughter was an adaptation of this short. When I was a kid, we owned a VW Vanagon that seemed a whole lot like Mickey’s trailer. It’s a short that I could watch over and over again. 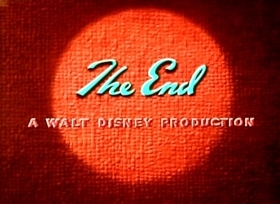 So, gushing aside, this short fits perfectly in with the other trio shorts, but to my mind, has some of the best gags in the Disney shorts. The sheer inventiveness on display here is on par with anything done in Mickey shorts before. Seeing the trailer fold and switch into different forms, and then the contortions that Mickey and Donald go through as the trailer goes down the hill…I just love it. 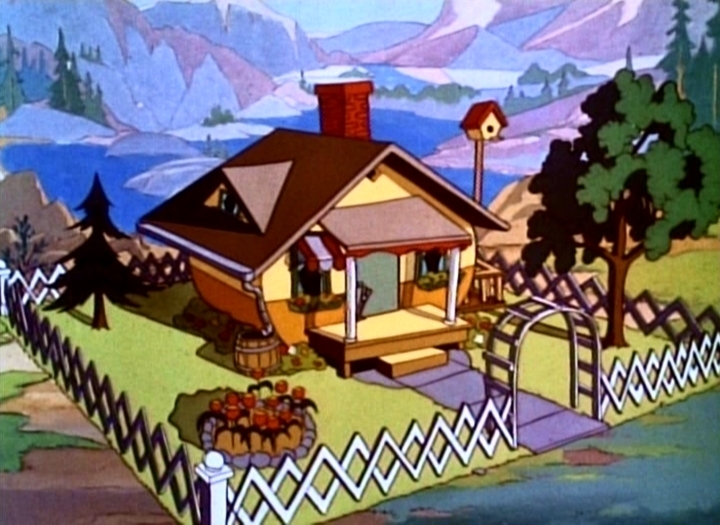 One of my real favorite gags is the very beginning, when Mickey wakes up and steps out onto his perfectly manicured lawn in this amazing landscape, and pulls the lever, having the lawn, backdrop and everything else fold up. It’s funny, but it’s also a commentary – we all want this idyllic life, but in the end, we are usually living in front of the city dump. I also love the breakfast scenes. 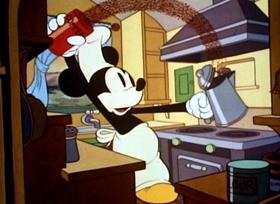 Mickey making the coffee by tossing things around the trailer, Goofy helping him get milk from a passing cow, dipping the pot under a waterfall for water – it all sounds wonderful. That’s the feeling I get from the first half of this short, is that idyllic, peaceful happy feeling that so many Disney shorts have. 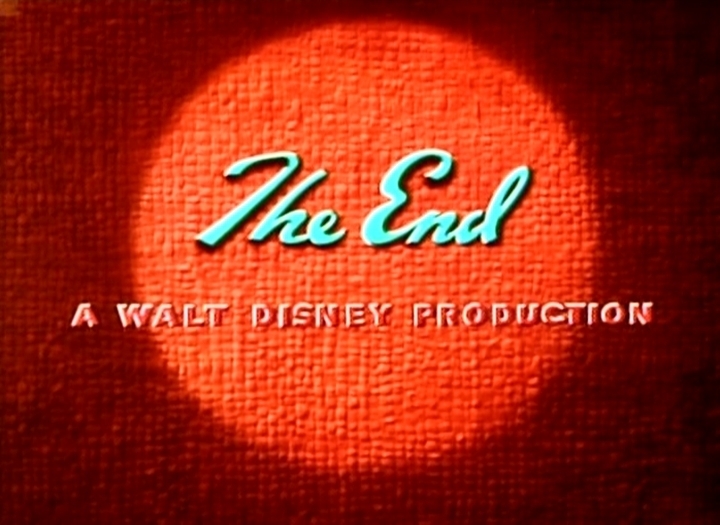 The second half of the short is when Goofy realizes that no one is driving the trailer, which in itself is a great gag. As he tries to right the ship, Donald and Mickey go wild, the trailer flying down the mountain past trains, falling end over end, and causing the two of them to plead for help, especially Donald. Like I said, I can’t really be objective about this one. 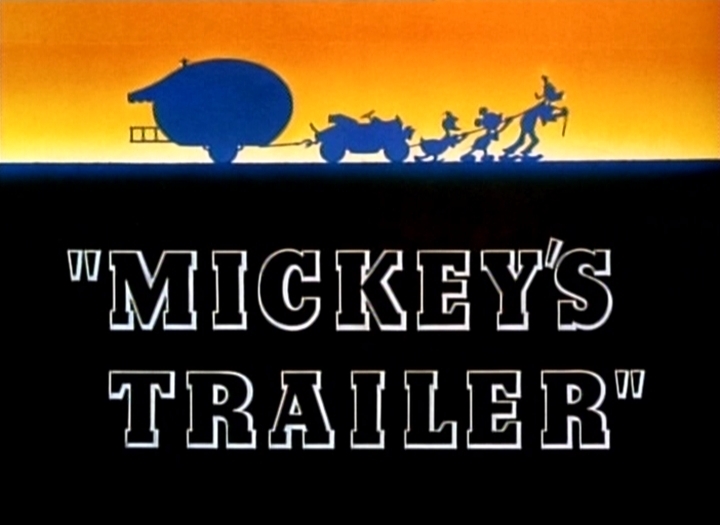 I love Mickey’s Trailer unconditionally, and I’ve always loved it. This is one of those shorts I watch over and over again, and always will be. This isn't the most famous of the trio shorts, but I think it's one that many fans recognize as being one of the best. I once bought a mug from the Disney Store based on this short – too bad the handle broke off! But I digress! This short has great inventiveness, funny gags and an exciting climax which keep it an absolute classic. Also watch out for a brief cameo of Pete as a truck driver. One of the repeated themes that works through the Disney shorts is the idea of technology gone bad and taking over our lives. Donald, in Modern Inventions, had a terrible time trying to get the various machines to work correctly. Even in the newer "MouseWorks" short, we see technology making life miserable for Mickey in Mickey's New Car and Mickey's Mechanical House. But for once, here with Mickey's highly adaptable 1938 Airstream trailer, things seem to go completely right, and the problems are the result of human failure, rather than technological. The scene opens with the boys camped out by a beautiful mountainside like. The birds are singing; the sky is crisp and clear; they sure have picked out a wonderful place to go camping; a place like you'd never find nowadays. 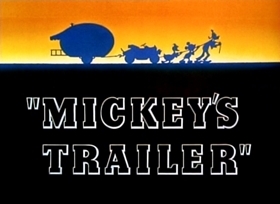 Mickey wakes up and pops out of the trailer, and pulls a lever. 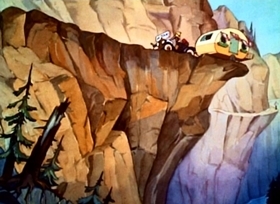 Suddenly, the landscaping is pulled back into compartments in the trailer, a door pops open ejecting Goofy in the car that will pull them along, and even the background fanfolds back into to trailer so we see that they have been camping next to the city dump all along. The first order of business is breakfast, and the passing landscape seems to provide everything they need. water for the coffee is taken from a passing waterfall; ears of corn are lopped off as they pass a farm. Even milk is provided as Goofy lures a cow into marching along beside them and Mickey milks her by hanging out the trailer window. Another button is pushed and the bathroom is turned into a dining room and breakfast is served. 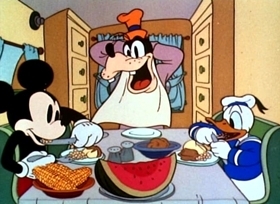 Goofy is called up to eat, but he might as well not have bothered. Because of the close quarters of the trailer, trying to eat potatoes is made impossible by drawers flying open; watermelon just makes a mess all over his face. (By the way ... whatever happened to bacon and eggs?) 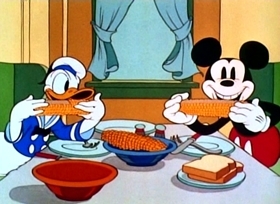 And in a scene that has been cut for most television screening, Goofy's attempt to eat corn on the cob only produces popcorn when he accidentally sticks his fork in an electrical socket. But isn't Goofy supposed to be driving the car? Yup ... and when Mickey points this out to him he runs back up to the drivers seat, accidentally unhooking the trailer. Goofy goes one way, the trailer the other, and it appears that Goofy got the easy way. The trailer, somehow defying the laws of nature, has to hang on to the site of a cliff, rampaging down the narrow hillside road. Mickey has to help a few times either pushing it back onto the road or hanging onto a streetsign to keep traction. Twice they are almost blasted by the same oncoming train! And after finally cannonballing off the cliff, they are bounced and turned over and over down the hillside. And where is Goofy in all of this? 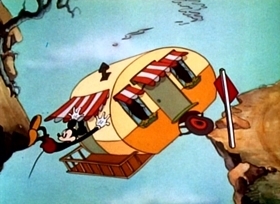 Tootling down the mountainside, oblivious to everything Mickey and Donald have gone through. The trailer does a perfect flip and bounces itself back to the car where it hooks itself back up. Goofy looks around, and sees that the trailer is still there ... well, hasn't it always been there? ... and says with relief "Well, I gotcha down okay!" If I ever go on vacation with Goofy, I'm driving.